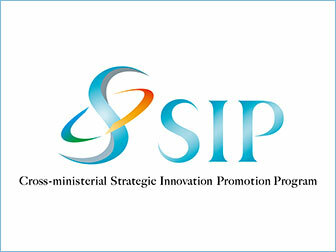 This is a program for achieving science, technology and innovation as a result of the Council for Science, Technology and Innovation exercising its headquarters function to accomplish its role in leading science, technology and innovation beyond the framework of government ministries and traditional disciplines. The program strives to promote research and development in a seamless manner from the basic research stage to the final outcome by endeavoring to strengthen cooperation among industry, academia and government under the strong leadership of the Program Director (PD). 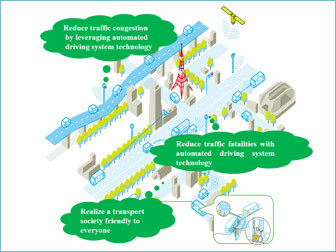 ”adus” stands for Automated Driving for Universal Services. SIP-adus is undertaking activities with the objective of solving issues of concern in today’s society, including reducing traffic accident fatalities and traffic congestion, along with securing transportation methods for the elderly and others with limited mobility. 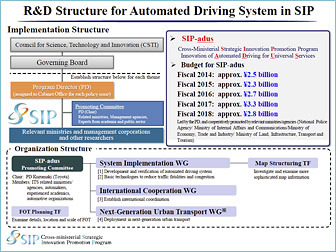 Mr. Seigo Kuzumaki was appointed Program Director for SIP Automated Driving Systems in 2016. 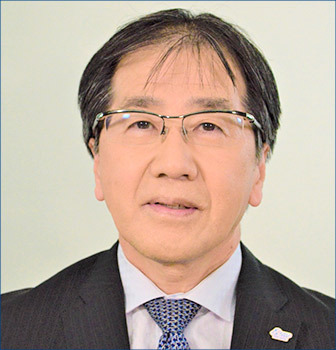 In his career at Toyota Corporation, he has had a leading role in strengthening vehicle safety performance, and was promoted to Chief Safety Technology Officer Secretary in the safety technology planning group in 2011. He assumed his current post in 2017. Mr. Kuzumaki received a Special Award of Appreciation from the NHTSA of the United States at ESV in 2007. The Research & Development plan sets forth the concrete goals and exit strategy for the project, and describes the details of the research & development process toward realization. 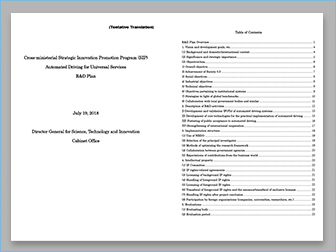 The plan contents are reviewed every year, and are simultaneously subject to rigorous examination by the Governing Board, the program’s assessment organization. SIP-adus develops ITS (Intelligent Transport System) with governments' cross-ministerial collaboration led by the Cabinet Office. The Promoting Committee acts as the decision-making body and three working groups have been established under its jurisdiction that progress study on specific issues seeking for solutions; System Implementation WG, International Cooperation WG and Next-Generation Urban Transport WG. © 2016 SIP-adus All Rights Reserved.